For those of us who love venturing into the wild, hot on the trail of roaming beasts and soaring birds, Bangalore can be a great base. From short joyrides around safari enclosures to roaming deep forest in order to spot animals in their natural habitats, you can sign up for every kind of experience. 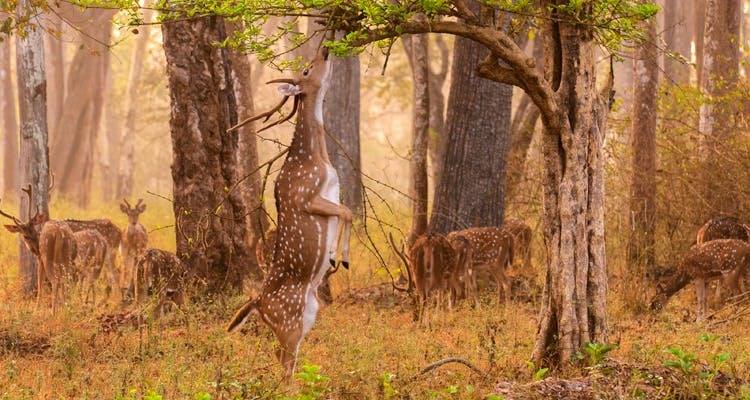 LBB hunts down the best safaris closer to Bangalore than you think. You can start off your wildlife spotting right here in the city. At the national park, you can hop onto vans and they’ll take you on a quick safari around the herbivore, lion, and tiger enclosures. While this may not be actual wildlife safari (they are kept within designated areas in the reserve forest area), the thrill of watching the majestic beasts stomping around is undeniable. You can read all about Bannerghatta here. South-east of Nagarhole is the Kabini Forest Reserve. The calm water of the Kabini River sits at the center and sees a steady stream of animals saunter by (elephants and deer are common and if you are lucky you’ll see a tiger too). Once a favourite hunting ground with the ruling British and maharajas, Kabini now is thronged by wildlife lovers (there are plenty of lodges and resorts around here) who come by for their water and land safaris. The breathtaking Nilgiris Hills, in Tamil Nadu, are home to the Mudumalai Sanctuary that’s surrounded by the Wayanad and Bandipur National Parks. While private vehicles are not allowed in the reserve area, you hop onto vans or jeeps for a tour of forest where you can possibly encounter Cheetal, Indian Gaur, Nilgiri Languar, tigers, elephants, and sloth bears. Once the favourite hunting grounds for the Maharaja of Mysore, Bandipur was thankfully declared a Tiger Reserve in 1974. Spread over 800 square kilometers, navigate its bumpy roads to gawk at roaming tigers, herds of elephants, wild dogs, hyenas, and spotted deer. An avid bird watcher, are you? Then, point your binoculars to the tall trees to catch glimpses of heron, egrets, falcons, woodpeckers, sandpipers and other winged creatures. Also known as the Rajiv Gandhi National Park, Nagarhole is an essential part of the Coorg experience. Arrive at the sanctuary gates, and queue up for the safari. Dotted by streams, valleys and hills, Nagarhole is great for spotting elephants, deer, civets, wild dogs and, rarely, tigers. Do note, that the park remains closed during the monsoon months (the mating season) or if forest fires occur. Bordering Coorg, the Wayanad National Park shares boundaries with Nagarhole and Bandipur. You can either hire out the park’s jeeps or take your own transport through the reserve, to gape at barking deer, wild boar, antelopes, sambar, leopards, bears and tigers. If you want to get closer to nature, sign up for guided two-hour treks. It’s at BR Hills the Western and Eastern Ghats meet. A famous temple dedicated to Lord Ranganatha (an avatar of Lord Vishnu) stands on what looks like a white cliff giving the region its name – Billi (white) Ranganatha Hills. Around this temple is the sanctuary and its most famous inhabitants are the large number of elephants (once a favourite poaching ground for notorious smuggler, Veerappan). You can either hire a jeep or take a guided trek through the forest to spot the pachydermes, gaurs, bison, deer, bears and tigers. Uttara Kannada’s famous Dandeli Wildlife Sanctuary is a protected tiger and elephant reserve. But it is the winged beauties that deserve a fair share of your attention. Home to more than 200 species of birds, you can get an eyeful of the famed Great Hornbill and the Malabar Pied Hornbill here. Also, don’t forget to drop by the neighbouring Kali Tiger Reserve (formerly known an Anshi National Park) where apart from tigers you might even spot the elusive black panther. The River Tern Lodge, that borders the Bhadra reservoir and is a short way from the reserve forest, organises evening safaris. Pile into their sleek jeeps and drive into the thick green forests to look out for gaurs, leopards, elephants, crocodiles, monitor lizards and deer. Named after the famous temple dedicated to Goddess Mookambika, that’s in the area, this sanctuary is where you find the endangered cane turtle and some of the most colourful butterflies. You can take your own car through the reserve, and also spot bears, tigers and leopards. One of the best safari experiences in South India, Periyar is home to large elephant and a significant tiger population. At the heart of the reserve is the artificially created lake that’s open for boat safaris. In an effort to promote eco tourism the park does not allow vehicle safaris of any kind, but you can embark on a trek if you want to spot bison, wild boar, langurs, and sambars.